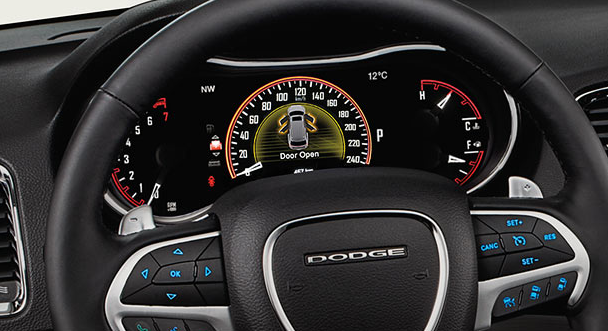 At Davis Dodge, you could find yourself behind the wheel of a Dodge Durango. Its brilliance covers every possible angle. 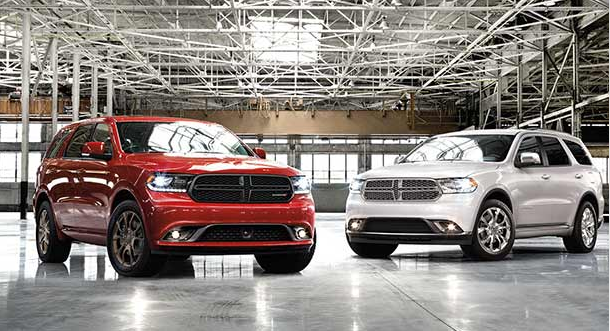 The 2016 Dodge Durango delivers Best-in-Class power and towing, inspired handling, bold styling and an interior filled with luxury and technology. Fuel economy is improved with new Stop/Start technology on the award-winning 3.6L PentastarTM VVT V6, while upgraded design cues keep the Durango in a class of its own. Talk with one of our representatives today, and learn why vehicle buyers come from Calgary, Lethbridge and Claresholm for a shopping experience at Davis Dodge. A power 12-way driver's seat with 4-way lumbar adjust comes standard on every model. The Limited adds a power 10-way front passenger seat, while both the R/T and Citadel models enjoy a power 12-way front passenger seat including 4-way lumbar adjust. Heated 1st- and 2nd-row seats are included in the Limited, R/T and Citadel, with the R/T and Citadel models adding ventilated front seats. 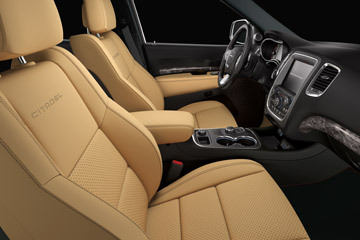 Captain's chairs for the 2nd row are also available and contribute to the Durango's over 50 different seating configurations. 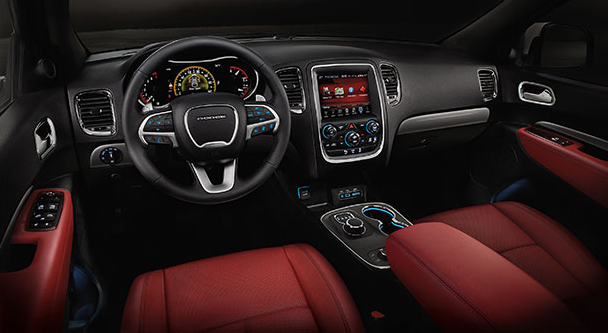 The Durango's fine attention to detail is found throughout the cabin with steering wheel-mounted audio and cruise controls, 7-inch full-colour customizable in-cluster display, tri-zone automatic temperature control and even a removable/rechargeable LED flashlight. One major distinguishing design feature is the rotary dial E-shift. Unlike a conventional steering column- or centre console-mounted shift lever, this innovation is ergonomically integrated into the centre console. This creates more usable console space and allows gear selection to happen with a simple turn of a dial. 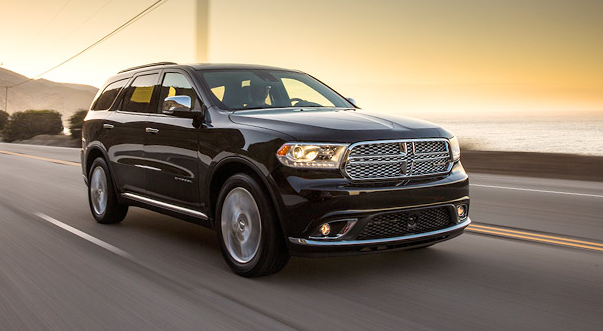 One of the most capable and versatile interiors lives in the 2016 Dodge Durango. 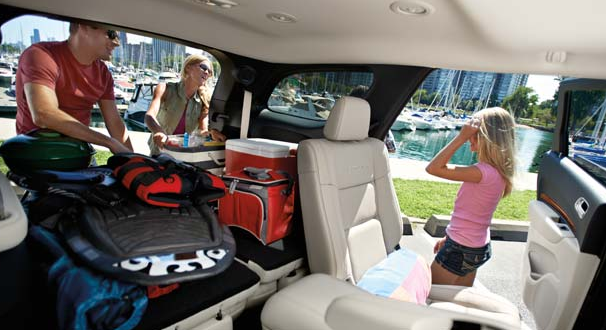 With over 50 different seating configurations available, you can adapt the Durango to whatever life throws your way. 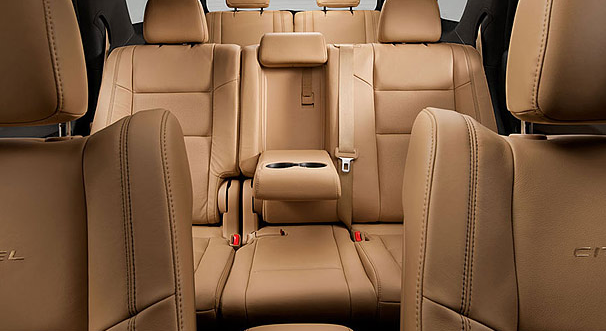 Every model comes standard with 7-passenger seating and 60/40-split fold-and-tumble reclining 2nd-row bench seat. Captain's chairs are available for the 2nd row, along with ventilated front seats and heated seats for the 1st and 2nd rows. It's all about the fine details. 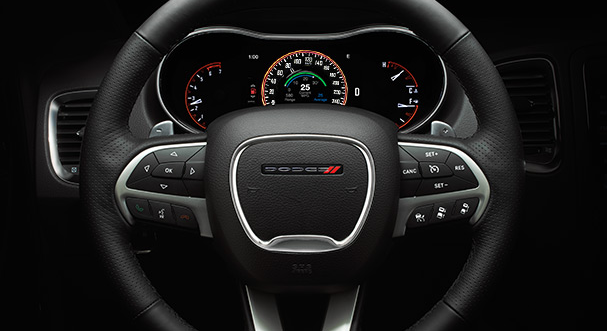 The leather-wrapped steering wheel fits perfectly in hand and available finishes like leather door trim and wood accents are as pleasant to the eye as they are to the touch. 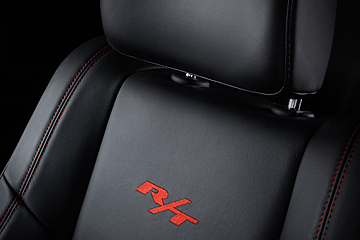 Black premium Nappa leather-faced seats with contrasting red accent stitching now come standard on the R/T model. Radar Red Nappa leather with black accent stitching is also offered. The R/T logo is also elegantly embroidered into the front seat backs, helping create a first-class experience on every drive. If a ride isn't quiet, it can't be considered refined. With a double-dash construction combined with a laminated windshield and front-door glass, the Durango delivers exceptional levels of sound isolation. 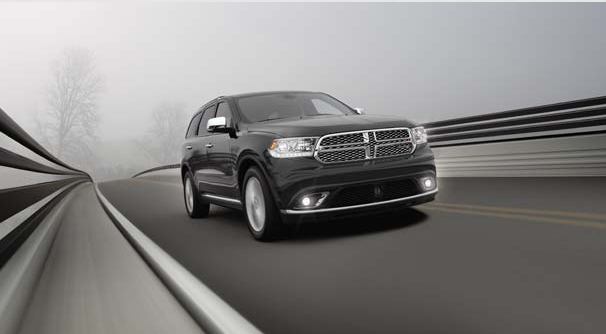 To stand out from the crowd, the Dodge Durango sets a bold tone with its signature floating split-crosshair grille available with dark or bright accents. The projector headlamps curve into the arched fender flares, and it all flows into muscular lines that personify the Durango's confident road presence. 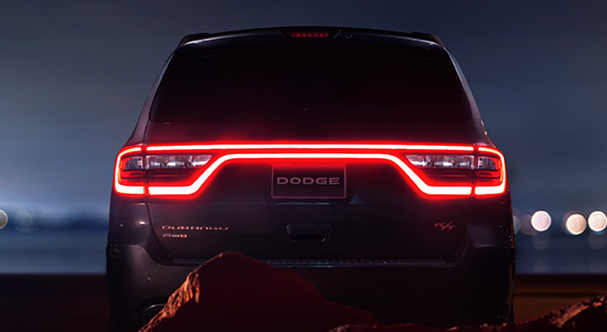 Out back, the distinguished design continues with the Dodge signature racetrack taillamps, featuring 192 individual LEDs that are as sharp as they are illuminating. 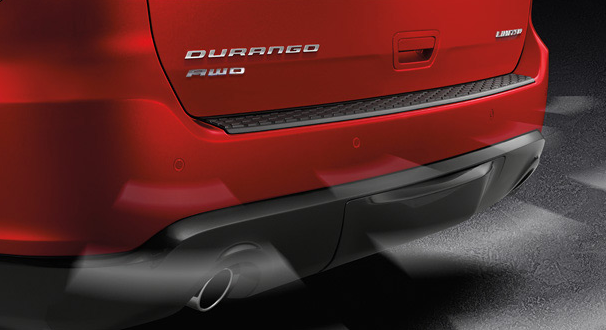 Aggressive front and rear fascias complete the Durango's aggressive design and create an SUV that rewrites all expectations. 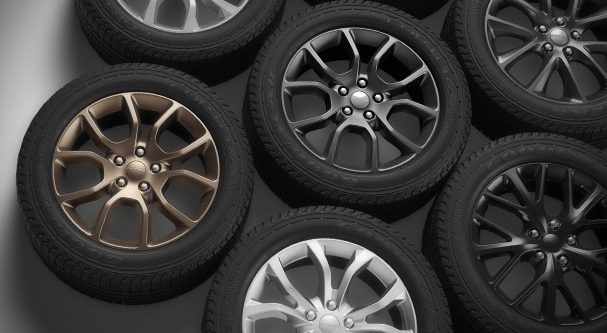 Choose from a selection of 18- and 20-inch wheels, including new designs and finishes. For 2016, exciting new appearance packages are also available, adding even more unique wheel designs to the lineup. You can upgrade the already stand-out design of the Limited and Citadel models with 2 new available packages (late availability). Brass Monkey Appearance Package – You'll turn even more heads with the Limited model by adding 20-inch Brass Monkey (Burnished Bronze) aluminum wheels, gloss black badging, dual exhausts, black headlamp bezels and a monochromatic exterior finish. Platinum Appearance Package – Enhance the top-of-the-line Citadel model with 20-inch Satin Carbon aluminum wheels and black headlamp bezels, along with exterior mirror caps, grille surround, fog lamp bezels, door handles, lower sills and badging all finished in platinum chrome. 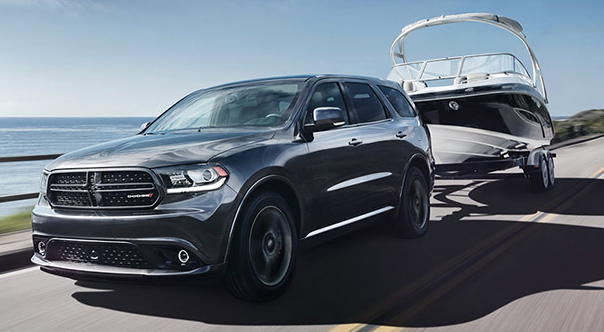 The 2016 Dodge Durango comes standard with all-wheel drive and delivers Best-in-Class AWD fuel economy as efficient as 9.5 L/100 km (30 mpg) highway. 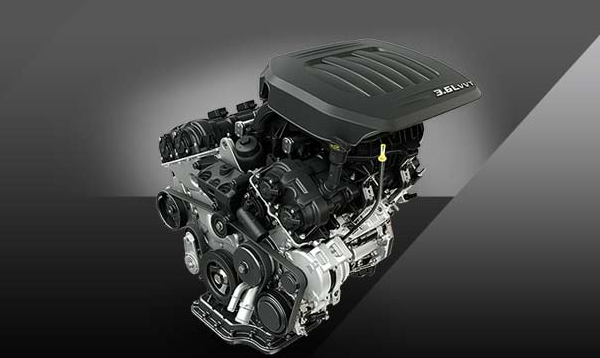 With up to 295 horsepower, 260 lb-ft of torque and Best-in-Class AWD fuel efficiency, the 3.6L PentastarTM VVT V6 engine is a proven performer. It leads the way with Best-in-Class V6 towing up to 2,812 kg (6,200 lb)27 and now comes standard with advanced Stop/Start technology for even better fuel economy. An 8-speed automatic transmission with paddle shifters and rotary dial E-shift comes standard for strong performance and exceptional fuel efficiency. The 3.6L PentastarTM VVT V6 now comes standard with advanced Stop/Start technology for increased fuel efficiency and lower emissions. It works by shutting off the engine when the vehicle comes to a complete stop. Amenities like the radio, gauges and climate control systems continue to operate, which makes this on/off transition completely seamless to the driver. As soon as the brake pedal is released, the engine restarts automatically and resumes normal operation. The system can be disabled via a switch on the dash. The Durango gives you Best-in-Class V6 and V8 towing so you have the capability you need no matter what engine you choose. With the Trailer Tow Package, you can pull up to 2,812 kg (6,200 lb) with the 3.6L PentastarTM VVT V6, or up to 3,265 kg (7,200 lb) with the 5.7L HEMI® VVT V8 engine. Trailer Sway Control comes standard to keep your loads in check, with the available Trailer Tow Package adding a Class IV hitch receiver, 4- and 7-pin wiring harness, full-size spare tire, heavy-duty engine cooling and rear load levelling suspension. 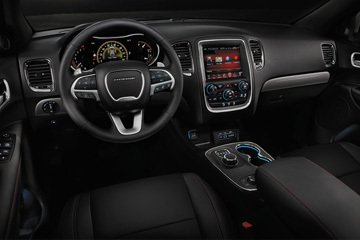 Uconnect® 5.0 multimedia centre with 5-inch touchscreen is standard on SXT and Limited, while the R/T and Citadel now come standard with a largest-in-class 8.4-inch touchscreen. It's safer, convenient and comes standard on every model. Hands-free communication with Bluetooth® streaming audio allows you to change music and control your compatible smartphone all with simple voice commands. You can also send and reply to text messages by selecting one of the pre-formatted responses and even read aloud the messages you receive. The available navigation system also works with voice commands so you can keep both hands on the wheel and your eyes on the road. This full-colour display centre comes standard on every model and sits perfectly in the driver's view. It keeps you up-to-date on vital vehicle data like fuel economy, trip information, temperatures, tire pressures and maintenance. 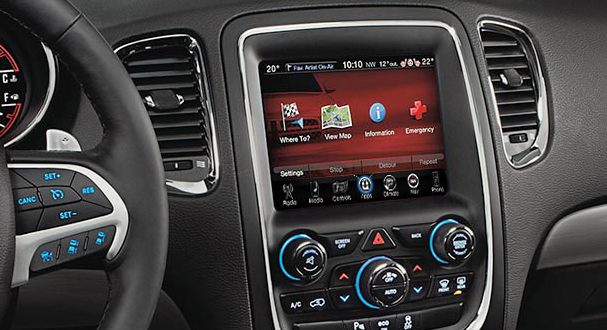 It also displays audio information and turn-by-turn directions of the available navigation system. The available Adaptive Cruise Control with Stop uses video and radar sensors to automatically adjust and maintain your cruising speed based on pre-set speed and vehicle distance settings. In certain circumstances, it can also bring the vehicle to a complete stop without any driver intervention. Forward Collision Warning with Active Braking is also available and can detect when you're approaching a vehicle or obstacle at an unsafe speed using front-mounted sensors. If this happens, it provides audible and visual warnings, and prefills the brakes to prepare for emergency driver intervention. 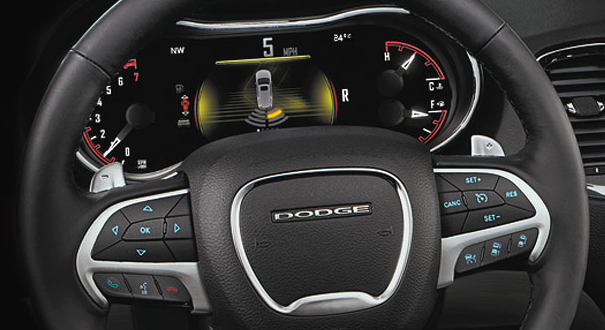 The available Blind-Spot Monitoring alerts you with an audible alert and visual icon in the sideview mirror when a vehicle is in your blind spot during lane changes with the turn signal activated. Rear Cross-Path Detection is included and uses advanced sensors to warn you of vehicles and objects approaching from either side as you reverse out of a spot. The available ParkView® Rear Back-Up Camera displays a high-resolution image of what's behind the vehicle on either the 5- or 8.4-inch touchscreen. 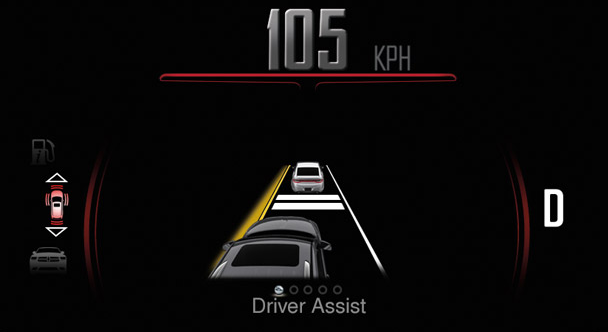 It engages automatically when you shift into Reverse and uses dynamic grid lines to help steer you safely into place. Included with this feature is the Park-Sense® Rear Park Assist, which uses sensors to detect objects in your path while reversing. A visual reference is provided in the 7-inch full-colour customizable in-cluster display centre, while an audible chime increases in intensity as you get closer to objects in your path.